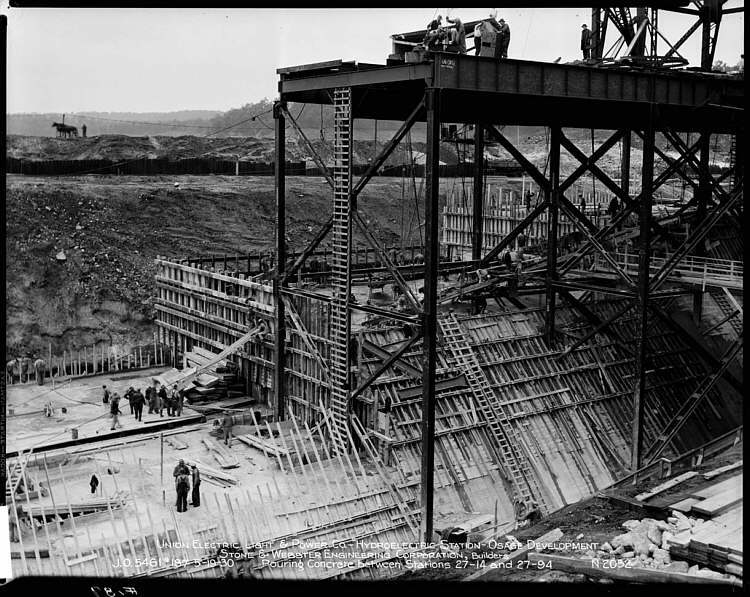 Actual construction of Bagnell Dam and what was to become the nation's largest wholly artificial lake began August 6, 1929; however, the project was studied as early as 1912. Financial difficulties plagued the proposal that a hydro-electric project be located on the Osage River near the railroad center of Bagnell, Missouri. Still, a preliminary permit was issued by the Federal Power Commission on November 12, 1924. A week later the newly-formed Missouri Hydro-Electric Power Company was authorized to perform the initial developmental work. Money woes continued. In 1927, Stone & Webster Incorporated, a Boston engineering firm, assumed the task of giving the project life. An exhaustive study was conducted. Plans were redesigned to meet the needs of Union Electric Light and Power Company of St. Louis, which on July 27, 1929, acquired all properties and rights of Missouri Hydro-Electric Power Company. That action placed the Great Osage Project on the road to reality some 17 years after it was first studied. Four months after construction began the stock market crashed. While the rest of the nation was caught in the clutches of The Great Depression, the mammoth Bagnell undertaking brought about a growth and expansion in middle Missouri which continues today. The project was divided into three categories. The Dam and Power House included construction of all features relating to structure and generating plant. These included a camp, roads, railroad tracks and temporary structures. Transmission Lines included all matters of design, location and construction of the lines to carry electricity from the plant to the marketplace. The Reservoir included location, land clearance, surveys and mapping of what is now Lake of the Ozarks. Once cleared, the reservoir was outlined. The Osage River was impounded and the lake began to fill on February 2, 1931. The lake was open to travel May 30, 1931. Backwaters extended up the Niangua, Grand Glaize, Grand and Pomme de Terre rivers. The dam site became the focal point for a resort industry which was spawned throughout the vast Lake of the Ozarks area. As the shoreline was developed, homes and businesses were established. Summer homes, cabins and lodges were built. Some relocation of families was required. As a result, Camdenton and new Linn Creek were created. A detailed core-boring examination of the dam site and the reservoir were conducted before even preliminary plans for construction were drawn. The integrity of the dam's foundation was thereby assured. The reservoir encompasses 92 square miles, or some 58,500 acres of which about 30,000 acres required clearing. The reservoir extends approximately 93 miles upstream from the dam. There are located in portions of Camden, Miller, Morgan, Benton, Henry and St. Clair Counties 1,150 miles of shoreline. The dam is of concrete gravity type, 2,543 feet long. It consists of a 511 foot long power station, 520 foot long spillway section and two non-overflow retaining sections adjacent to the river banks. The dam supports a concrete highway structure, which includes a 20 foot wide roadway and a three foot wide sidewalk, both spanning the entire length of the dam. The substructure of the power station is of mass and reinforced concrete founded on rock. Initially, there were six main generating units; two were added in 1953. The spillway section is equipped with twelve flood gates, each 34 feet wide by 23 feet high. The gates are used to control the reservoir water level during flood periods. Each weighs 27 tons and is capable of discharging 101,000 gallons of water per second. Concrete piers between the gate openings support the highway and operating platform above the crest of the spillway. Two 70-ton capacity cranes operate the flood gates and the head gates for the power station. A construction railroad four miles long was built from the end of the Missouri Pacific line at Bagnell to the dam site. A narrow gravel road connected Bagnell and the site. A temporary stream station with two turbine generators was constructed adjacent to the dam site. The first section of the dam to be built was the spillway and abutment portion west of the river channel. Lines of steel sheet piling were driven from the river to the west hillside. A coffer-dam was constructed. A construction bridge was built downstream from the dam site, accommodating trains bringing construction materials in. That bridge also supported three gantries which were used in placement of concrete. The concrete plant was on the west side, downstream from the construction bridge. During construction 60,000 car loads of materials were hauled to the project site. Placed end to end, the cars would form a train reaching from St. Louis to Chicago and back. Enough lumber was used in the concrete form work for the dam and support structures to build an Atlantic City-type boardwalk 60 miles long. The concrete used I the dam would build an 18 foot roadway from St. Louis to Topeka, Kansas. Sand and gravel to make concrete were dredged from the Osage River bed 3 ½ miles downstream. Five-thousand eighty-two cubic yards of concrete were poured in a single day during the construction period; 113,000 cubic yards were put in place in a single month. The water impounded in the reservoir is enough to supply the daily needs of the city of St. Louis for more than 12 years, some 650 billion gallons. Some 4,600 workers were employed at one time or another at the project site. During the time when the nation was mired in the Great Depression, the Great Osage Project was attracting workers from all over the country. Bagnell was the only major construction project at the time and proved to be an immediate boon for the entire area. Long lines of people seeking employment formed at the project site. Living quarters for many of the workers were located on the east hillside. Roads were fashioned to provide access to points throughout the work and living areas. Out of the project rose the communities of Dam Site, Spring Camp and Conner's Camp. The Osage development was to form the third of a group of power sources for Union Electric Company, which was already operating steam stations on the Mississippi River at St. Louis and Cahokia, Illinois and a hydro-electric station on the Mississippi at Keokuk, Iowa. With its large storage capacity, the Osage Plant was counted on to provide electricity during times of maximum demands by Union Electric customers. Osage Plant was connected to the St. Louis system on October 16, 1931. The expanded system allowed Union Electric to sell power to St. Louis and Rivermines customers at less cost. Not long after Osage Plant began operation, electrification came to the lake area. The first distribution pole was set on the south side of the Osage River. The first power line extended from the spillway structure to an H-frame structure on the south bank. This line was energized on Christmas Eve, 1931, and served 24 customers. In the years before the dam, residents made their livings largely in agriculture and forestry. Forests were harvested for railroad ties between 1880 and 1915. Bagnell was a leading railroad tie shipping center. The dam project changed that. Now, the area's economy is diversified. Tourism is the main industry. The Ozark heartland today is a synthesis of the wilderness Lewis and Clark and Zebulon Pike explored in the early 19th Century and a development which fostered economic and cultural growth. Bagnell Dam, that $30,000,000 venture, is the life blood of the Great Ozarks Area. Made possible by those who refused to succumb to adversity and who were convinced of its benefit to mankind. As more and more people discovered what the area had to offer, marinas, restaurants, fishing and swimming facilities, picnic and camp grounds and various amusements sprang up. In 1981, an estimated $200 million in retail business was generated annually. The area is located within 550 miles of more than 50 million people, people who flock to this Missouri paradise year after year. A unique recreational area soon became a vacation playground for those living in the Midwest and beyond. Area residents began to enjoy a more spirited lifestyle, buoyed by that beautiful body of clear water-Lake of the Ozarks. The accomplishments achieved during the building of Bagnell Dam are incredible. When added to the fact that the project was completed in 18 ½ months, four months ahead of schedule, they become nearly incomprehensible. Construction of a village designed to accommodate 1,200 men and 72 families. Extending the railroad 4 ½ miles from Bagnell to the dam site including the construction of a bridge across the Osage River. Laying of 14 miles of yard tracks. Building a landing field near the general storage yard to accommodate the power company's plane which made scheduled trips between St. Louis and the dam. Construction of two transmission lines, one 120 miles long, the other, a double circuit line, 136 miles long. Preparation of 95 square miles of reservoir. Mrs. Ralph O'Fallon, Miss Noma Ann DeGraffenreid and Miss Oma DeGraffenreid Kidwell, claim the distinction of being the first to drive across Bagnell Dam when it was opened to the traveling public. The left the G.R. DeGraffenreid home in a 1928 Chevrolet coach at 4:00 a.m. and arrived at the west end of the Dam at 5:00 a.m. Since the barriers were not taken down until 6:00 a.m., they sat in their car with the rain puring down and waited patiently to be the first to cross. While crossing, they met four others cars and the Chevrolet sped away as the occupants strove to be the first to cross the Dam. When they arrived at the east end they looked back across the lake to see that the other cars had not yet crossed. They had succeeded in being the first to cross! Mrs. O'Fallon's first husband, Lloyd DeGraffenreid, died in 1934. Oma DeGraffenreid became Mrs. Gail Kidwell of Kaiser. Noma Ann was active in the Riverview Baptist Church as well as hobbies and traveling. One of the special displays we have at the Miller County Museum is a full series of photographs showing the construction of the dam at various stages.